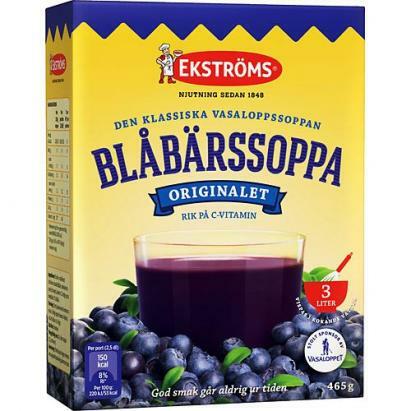 Ekstroms Blabarssoppa Originalet - Blueberry Fruit Soup, 5.5 oz / 155 grams. Ekströms original Blueberry Fruit Soup is a great source of vitamin C and perfect as a snack or as dessert. Ekstroms Blabarssoppa has been made world famous thanks to the ski race Vasaloppet, where it is always served warm to the skiers. The Swedish word for bilberry, blabar, literally means "blueberry". However the beverage is not made from the North American blueberry but from the bilberry, which grows in the wild throughout Scandinavia and other parts of Europe. Contains two packets, each makes 2 cups. Whisk powder with boiling water and drink when cooled.